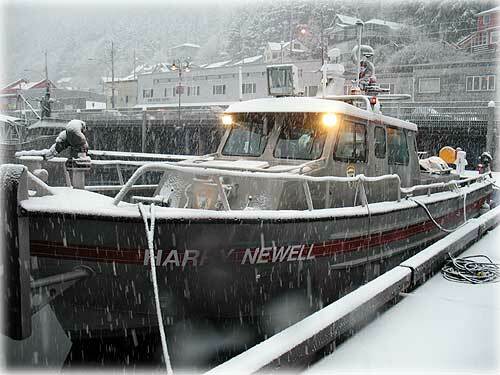 Fire Boat Harry Newell warming up on a winter's day. National: Fixing nations' broken banking system will be costly By BARRIE MCKENNA - Capping executive pay is the easy part. But fixing the broken banking system remains as elusive a goal for President Obama and his new Treasury Secretary, Tim Geithner, as it was for the Bush administration. Experts say it will take time, and a whole lot more taxpayers' money -- perhaps another $2-trillion. And maybe a few more false starts. The administration will unveil what Geithner called "a comprehensive program for financial recovery" next week. "We will have to do more -- substantially more -- to fix this crisis," Geithner said. National: How did the nation climb out of the Great Depression? By MEGAN MCCLOSKEY - As senators wrangle this week over Washington's plan to stimulate the economy, the debate is laced with competing interpretations of something that happened seven decades ago: the Great Depression. Many Democrats believe government's spending under Franklin Roosevelt helped the nation climb out of the Depression. They support President Barack Obama's plan to inject $900 billion into the economy. Other lawmakers, mainly Republicans, believe the opposite. They want to rein in Obama's stimulus package and provide more tax breaks so the private sector can reverse the downturn. "All the government spending did not take us out of the Depression," Nevada Republican Sen. John Ensign said. So which view of the Depression is correct? The findings are surprising given how little attention meth use has gotten in anti-drug campaigns compared with other drugs, such as cocaine and marijuana, wrote the authors of the study, which was conducted by the RAND Corp.
"Obviously the next step is to look into prevention efforts, enforcement efforts," said Nancy Nicosia, the study's lead author and a RAND economist. Meth, sometimes known as "speed," "ice," and "crank," is a highly addictive stimulant that affects the central nervous system. It can be smoked, inhaled or injected. Alaska Science: Ernest Leffingwell: Scientist with a fan club By NED ROZELL - One hundred years ago, a group of men sailed to the northern coast of Alaska on an expedition to find a land mass rumored to exist in the Arctic Ocean. Sea ice disabled the ship, they didn't find the land, and after wintering in the North everyone hurried back to warmer places. Except for Ernest Leffingwell. Leffingwell, a geologist, teacher, and a veteran of the Spanish-American War, stayed behind on Flaxman Island, a sandy wedge of land north of Alaska's coast and 58 miles west of Kaktovik. He lived for nine summers and six winters in a cabin made from the ship that brought him there in 1906. Scientist and explorer Ernest Leffingwell spent nine winters in Flaxman Island, off Alaska's northern coast. Photo from the book, Conquering the Arctic Ice, by Ejnar Mikkelsen. From that lonely home base, Leffingwell made 31 trips around the area by sled and small boat, covered about 4,500 miles, and camped in a tent "about 380 times." This detail he included in a 250-page report for the U.S. Geological Survey that reads like a manual on how to live and perform science in the Far North. He gained some fans from the works. "He wasn't a traditional scientist," said University of Alaska Fairbanks permafrost scientist and world traveler Kenji Yoshikawa, a Leffingwell admirer. "He was more like an early explorer from the 18th century." "Unlike his counterparts of the time who were mostly looking for glory and doing only enough science to support that, Leffingwell quietly wandered on his own, dedicating himself to a better understanding of this interesting place," Matt Nolan, from UAF's Water and Environmental Research Center, wrote on his Web site. Nolan found rock cairns at spots where Leffingwell photographed Okpilak Glacier in the Brooks Range in 1907. Nolan repeated Leffingwell's photos in 2004 and shows the impressive loss of ice since Leffingwell hiked there from the coast. DALE MCFEATTERS: Tripped up by the tax code - Congress likes to talk about simplifying the tax code -- which, bear in mind, is solely its own creation -- but never does. Perhaps the tax problems of three of President Obama's nominees to top posts will prompt it to act. Nancy Killefer, Obama's choice to be White House performance czar, withdrew over $946.69 in back taxes, interest and penalties for a brief period when she failed to pay the unemployment compensation tax for her household help. This is the recurring nannygate problem that came to prominence when it tripped up then-President Clinton's first two choices for U.S. attorney general. Thomas Daschle withdrew from consideration as secretary of Health and Human Services over $140,167 in taxes and interest because he failed to treat the use of a company-provided car and driver for three years as taxable income. JAY AMBROSE: Billions of lost jobs? - As if to make positively sure no one missed the point that congressional Democrats don't have the slightest idea what they're doing with the stimulus package, Nancy Pelosi told the press the other day that prompt action was necessary because the United States is losing 500 million jobs a month. That's a lot because, if you figure it out, we could then have lost 6 billion jobs by the end of the year, and that's nothing to sneeze at in a country of 300 million people. Oops! Something is wrong here, but maybe you say it is no big deal -- everyone makes slips of the tongue and 500 million sounds something like 500,000 and we have in fact been losing roughly that many jobs a month lately. Such might be a good argument except that this is the same speaker of the House who was recently explaining how condoms could come to our economic rescue, who feels compelled to insult Republicans when she needs their support and who once said any progress in Iraq was due to nice Iranians instead of surge tactics. Please select the proper category before posting. Dec. - Jan. - Feb.